Eunice LaFate has infused Folk Art into everything she touches, and has used the art form to improve the lives of the people and communities she works with. Originally from Jamaica, LaFate’s creative vision finds its origin in the colors and tones of the island’s people, landscapes, and culture. An accomplished self-taught artist who has been painting for more than 20 years, her work is in the permanent collections of the William Jefferson Clinton Presidential Library in Little Rock, Arkansas, as well as the Blue Ball Barn Museum in Wilmington, Delaware. 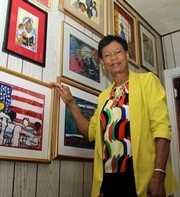 As a speaker for the Delaware Humanities Forum, board member of Creative Vision Factory, and advocate for the Folk Art form, LaFate has encouraged participation in the creation of art by children and adults across the state, including bank employees, Job Corp students, and people with disabilities. A recent highlight of LaFate’s work was her 20-Year Folk Art Retrospective Exhibition at the Blue Ball Barn Museum, complemented with the release of her documentary “ARTS AS PREVENTION” in the fall of 2013.